The one and only Fannie Flagg, beloved author of Fried Green Tomatoes at the Whistle Stop Cafe, Can’t Wait to Get to Heaven, and I Still Dream About You, is at her hilarious and superb best in this new comic mystery novel about two women who are forced to reimagine who they are and what they are capable of. Mrs. Sookie Poole of Point Clear, Alabama, has just married off the last of her three daughters and is looking forward to relaxing and perhaps traveling with her husband, Earle. The only thing left to contend with now is her mother, the formidable and imposing Lenore Simmons Krackenberry—never an easy task. Lenore may be a lot of fun for other people, but is, for the most part, an overbearing presence for her daughter. Then one day, quite by accident, Sookie discovers a shocking secret about her mother’s past that knocks her for a loop and suddenly calls into question everything she ever thought she knew about herself, her family, and her future. Feeling like a stranger in her own life, and fearful of confronting her mother with questions, Sookie begins a search for answers that takes her to California, the Midwest, and back in time, to the 1940s, when an irrepressible woman named Fritzi takes on the job of running her family’s filling station. With so many men off to war, it’s up to Fritzi and her enterprising younger sisters to keep it going. Soon truck drivers are changing their routes to fill up at the All-Girl Filling Station. But before long, Fritzi sees an opportunity for an even more groundbreaking adventure when she receives a life-changing invitation from the U.S. military to assist in the war effort. As Sookie learns more and more about Fritzi’s story, she finds herself with new answers to the questions she’s been asking her whole life. 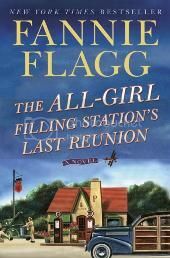 The All-Girl Filling Station’s Last Reunion is a perfect combination of comedy, mystery, wisdom, and charm. Fabulous, fun-loving, spanning decades, generations, and centered on a little-known aspect of America’s twentieth-century story, The All-Girl Filling Station’s Last Reunion is Fannie Flagg, the bestselling “born storyteller” (The New York Times Book Review), at her irresistible best. Fannie Flagg is one of my favorite authors, and I never hesitate to pick up her novels when they are released. Usually, they end up being a breath of fresh air for me, and instantly read like old book friends. I can't wait for this newest book to be released! The All-Girl Filling Station's Last Reunion: A Novel will be released on November 5, 2013, from Random House.